Solid Brass Porthole Mirror Key Chain 5"
This nautical-themed key chain is both adorable and functional, featuring a brass porthole with mirror key medallion. Crafted from solid brass, this key chain is as beautiful as it is durable and functional with a knurled knob allows you to easily and securely add or remove keys from the ring. These wonderful key chains make ideal gifts for all. Look into the mirror of this beautiful porthole brass keyring, and picture a ship sailing across the Atlantic on a voyage to the new world. Used on sailing vessels for hundreds of years, portholes offer a glimpse of the outside world from the depths below decks. Ideal for the sailor or ship enthusiast in your life, each of these solid brass keyrings are a little reminder of life at sea. Taking in the world around you these brass keychains appear to have a life of their own within, perhaps a reflection of your own hopes and dreams. With just one look these delightful little portholes will transport you to your favorite ship, whether a powerful Naval destroyer or a luxurious pleasure yacht, and as you stare into the mirror imagine opening the porthole to the ocean beyond. 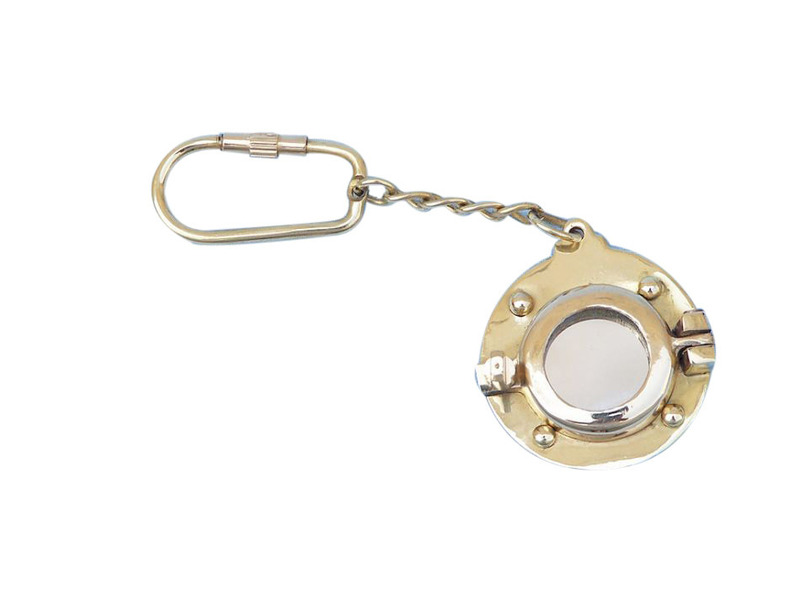 The ubiquitous porthole is a standard bearer amongst nautical décor, and each of these solid brass keyrings is recreated in full detail, down to the tiny latch. While your keys open the doors to your every day life, these solid brass keyrings are a small reminder to take a look outside and appreciate the world.